Black Cherry. 65 days. Indeterminate. A small round cherry with classic black tomato flavor. Sweet yet rich and complex. Tall, vigorous plants. 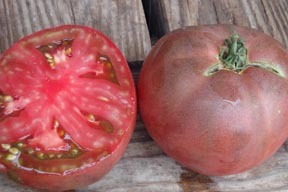 Black Krim. Indeterminate. 69 days. Fruits are a dark, deep brown-red with green shoulders. Interior is a deep, reddish-green color. Sweet and tasty. Early maturing 12 oz. fruits. Fruit sets well even when the weather turns hot. Russian heirloom. Cherokee Purple. 80 days. Indeterminate. Very productive plants with loads of 10-12 oz. dusky rose/purple fruit with deep red interiors. They are absolutely delicious with a sweet and rich taste. Heirloom from Tennessee. Dana's Dusky Rose. 80 days. Indeterminate. Into the fourth year of growing this wonderful tomato, we have concluded that it is indeed a great flavored tomato. Medium size with a good acid / sugar balance. Still my favorite.